What causes the price difference? Will the NBN change anything? Are we getting ripped off on broadband? 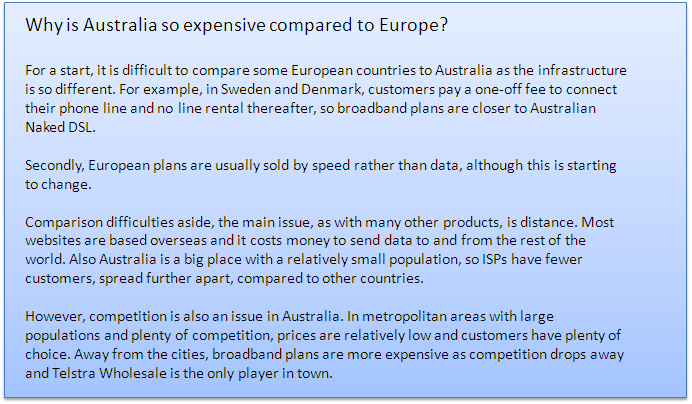 At Compare Broadband, we are often asked why broadband is more expensive compared to other countries. But is broadband really more expensive Down Under, and if so, why? Will the NBN bring us into step with the rest of the world? Thanks to research from Google, we can take a look at broadband prices across the world and see how Australia compares. When using purchasing power parity as a way of evening out the cost of living discrepancies between countries, it’s clear Australia is not the most expensive place in the world for ADSL broadband. However, when comparing Australia to European countries such as Spain, Italy and the UK, we are top of the list. The US is not included in this comparison because Google researchers looked at cable plans in the US, while we only wanted to look at countries that use ADSL. ADSL is not the only type of broadband. In Australia, mobile broadband is becoming increasingly popular. 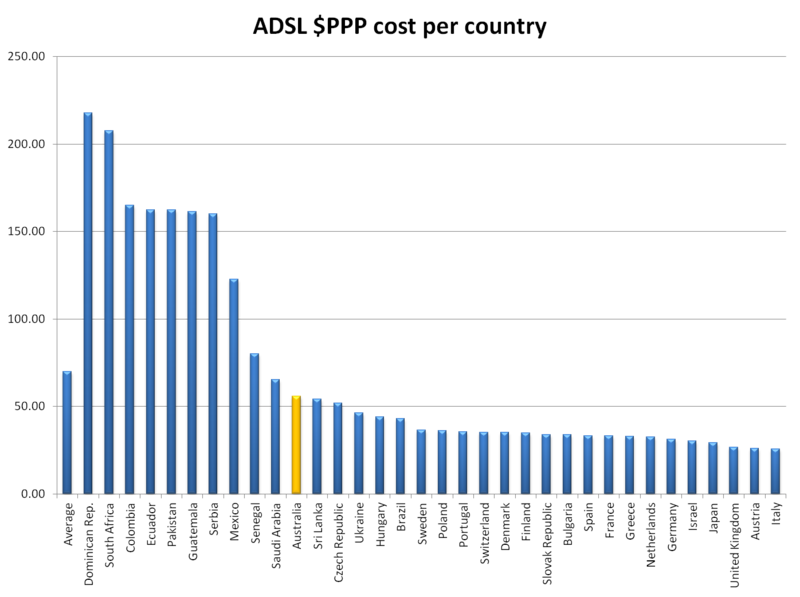 If you compare the prices between countries for mobile broadband, the story is very different. When it comes to mobile broadband, Australia is one of the cheapest countries in the world: better value dollar for dollar than Hong Kong, Canada, UK, France and many others. The difference may be down to competition, as Australia has three competing mobile networks and a host of MVNOs re-selling plans on the Optus network. Finally, we can take a look into the future of broadband in Australia by comparing some of the fibre plans soon to be available on the National Broadband Network (NBN). The project will cost a lot of money and this will have to be recouped from customers but on the other hand, the NBN should sort out any competition issues by charging a flat fee to ISPs. 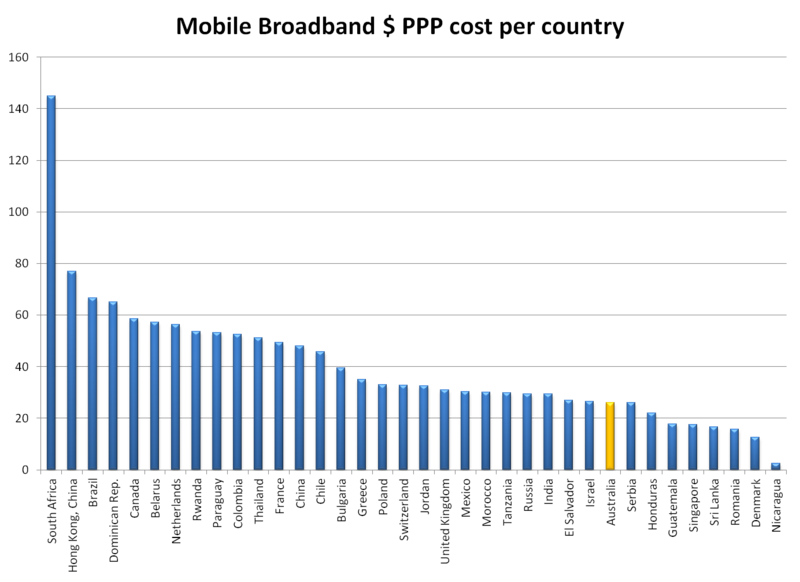 In terms of comparing the cost of fibre optic broadband plans, Australia comes out as fairly average. 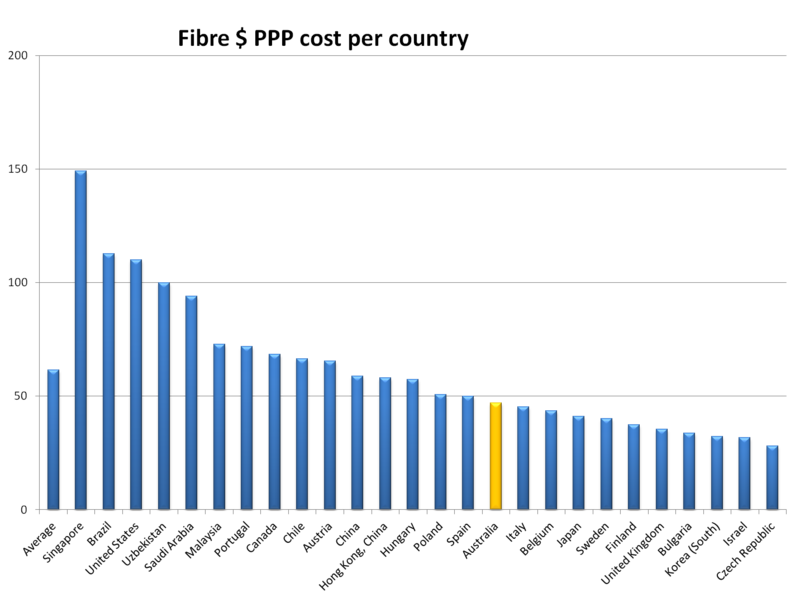 Plans announced so far are on average cheaper than the US and Canada, Malaysia, Singapore and Hong Kong, but more expensive than Japan, South Korea and the UK. However, the Australian market is very new compared to South Korea and Japan, with most of the budget ISPs yet to announce their NBN plans. Once more people have access to the network, prices could come down further. In other words, Australia is currently one of the more expensive countries to live in for an ADSL connection but the market is rapidly changing. As customers move away from ADSL and use a mixture of mobile broadband and fibre plans, Australia will shift from being one of the most expensive countries in the world for broadband to one of the cheapest. And fastest.